Breeders Cup champion KARAKONTIE planned to run Jacques le Marois Sunday 16th August Deauville. Breeders’ Cup champion Karakontie is due to make his belated return to action in the Prix Jacques le Marois at Deauville on August 16. However, the heavy rain in Normandy this week may incur revised decisions for the runners this week end at Deauville. The Jonathan Pease-trained colt has not been seen in competitive action since landing the Breeders’ Cup Mile at Santa Anita last November, & should return to America later in the year. 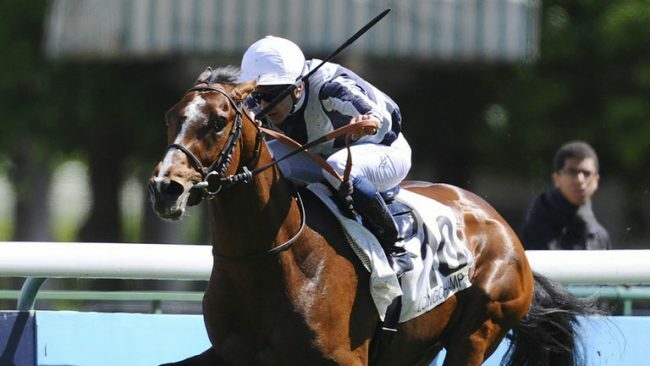 End July Alan Cooper, racing manager for his owners, the Niarchos family, said: “Karakontie worked out well on the racecourse at Chantilly recently. “Jonathan was delighted with him, as was Stephane Pasquier. 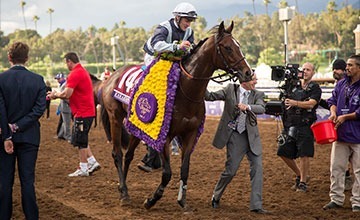 “As long as we have a trouble-free run between now and August 16, the plan is for him to make his reappearance in the Jacques le Marois.”The main aim is to return to the USA for the Breeders’ Cup Mile. The ideal scenario would be to run in the Marois, the Prix du Moulin and then go to the Breeders’ Cup.Deauville La Touques racing organised by France Galop. top Photo Wendy Wooley with thanks & courtesy Equisportphotos. Below Karakontie ridden by Stephane Pasquier. With thanks and courtesy SKYSPORTS.